"Contextual collaboration" is a new term whirling in the industry today. This phenomenal new type of business asset can be realized by two major mechanisms: the components managing mechanism and the services delivery mechanism. The component managing mechanism deals with calendar, workflow, messaging, e-mail, and so on, while the services delivery mechanism deals with receiving and responding to a request. In terms of IBM product offerings, we have Domino for the component managing mechanism and WebSphere for the services delivery mechanism. We need standards to connect the applications from different business entities: your customers, your suppliers, your business partners, and you. These business entities may run their business applications on different platforms, different application languages, different networks, and so on. To connect these un-identical entities together, we need standards. For that, we have Web Service standards such as SOAP, WSDL, XML, and UDDI. 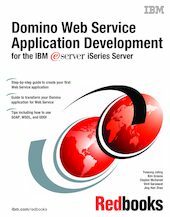 This IBM Redbooks publication provides real application scenarios which illustrate how to transform existing Domino applications into either a Web Service provider or a Web Service requester. This is achieved and served through the integration of Domino and WebSphere Application Server.